Barbing salon business plan in Nigeria – The Hair barbing salon business remains one of the rapidly growing industries in Nigeria today. To some people, this venture is for the 3rd class citizens therefore, not a serious money making business. Are you one of those who assume that barbers are low income earners? You are very wrong! Let me take a little of your time to show you the profits you can make if you will own and run a barber shop today. Me: Bros, do you really make money as a barber? Barber: (smiles like there’s something he knows that I don’t know. Keeps quiet for a while and then responds with a question of his own) Do you know why I love this business? Barber: (smiles again) this business is not seasonal. Everyone’s hair will always grow. No matter how the economy is, people need their hair cut and since it’s not something most people can do for themselves, they will always need my services. Me: (what he said was true so I probed more) if you are implying that you make good money, Ok, so like how much do you make every day from this business? Barber: (smiles again) I give a minimum of 20 haircuts each day on regular days. By regular days, I mean from Monday to Thursday. Then from Friday to Sunday, I give about 30 haircuts on each of these days, we call those our peak days. I also have 11 VIP customers who I give “Home Service”. I give all of my VIP clients a haircut once week at the rate of N1500. Me: So why are entrepreneurs overlooking this business that is capable of making them good money? Barber: Because it looks dirty and doesn’t blow whistle! People naturally like businesses that make lots of noises even if they don’t bring in as much money as the noise they make. When you are planning on setting up a profitable barbing salon business in Nigeria, you should put the following factors into consideration. Experience – This is an important step that has to come first to succeed as a stylist/barber in this business. You cannot rush into it all in the name of becoming self-reliant or because you have given a few of your friends good haircuts. You will only get yourself into a bigger problem because if you give a “not too” satisfactory service, you are sure to be shouted on, yelled at or even given a dirty fight. So take some time off and learn what the business demands. Learn different styles in vogue, hair treatment, health and beauty tips and customer care. Don’t be in a hurry to become a barbing salon owner. Go through training first, even if you won’t be the actual person giving the haircuts in your business! There are many shops out there that will be more than willing to teach you at cheap rate. The internet is also a good resource place. Register your barbing salon business with the corporate affairs commission Nigeria. Choose the right location – A Street that is easily accessible from all parts of your desired area. Busy streets, close to a shopping market/ mall, are an advantage. Start Up Capital – The amount of capital you need to start the business depends on the type, choice and quality of salon design, rent, fixtures and leasehold improvements and equipment that you intend to use. With these items in place, you can start your barbing salon and expand as you begin to make profit. How to Make Your Clients Stay! Keep your clients satisfied – It is important that your business create and maintain the desirable reputation as a quality hair and salon operation. Have the required tools and skill to execute a wide range of hair styles and styles in vogue. Take note of your clients’ preferences and implement them. Be gentle but time conscious while attending to a client. Hire capable and well trained personnel. As much as you need to make profit, do not charge too much or your clients will run away. Find out what other barbing salons around your area charge and fix yours within the same price range. Trill your customers with new offers or special promos. “Half the price off for all new clients” “free haircuts” “barb twice and get one free” promos will make them clients for life. Start Small. People make the mistake of wanting everything in proper place before opening for business. I advise that you start small and grow from there. A saying goes like this: Success builds upon success! 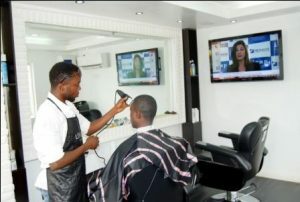 Get your own barbing salon business plan in Nigeria here. This business plan can be used to apply for bank loan, seek out investors and be used for business plan competitions. To place order for your sample barbing salon business plan in Nigeria, call us on: +2347033378184 or via email: hello@businessplan.com.ng. God bless u richly for the eye opener….i think av learn n ready to make money….its my long time dream..i love barbing. Thanks in a million. I already have a barbing saloon but I don’t know how to barb. I base in Nigeria, I’ll like to learn, do u have any branch here in Nig? How long dose it take to learn? Once again, I appreciate ur lecture. Like how much can someone use in opening a barbing salon? This is impactful .pls where can I get the price of necessary tools for barbing in Lagos .thanks so much . wow I am really bless with this piece. managing one (shop) in Kaduna although in a village. Very proud of my self bein a barber/stylist. Am located in bauchi state. For mor gist,u can me on 08066574066@Coolcut. Awesome post, I’m considering opening one soon.